This past Fall I got myself an awesome little puppy, Chico "Che" Guevara. 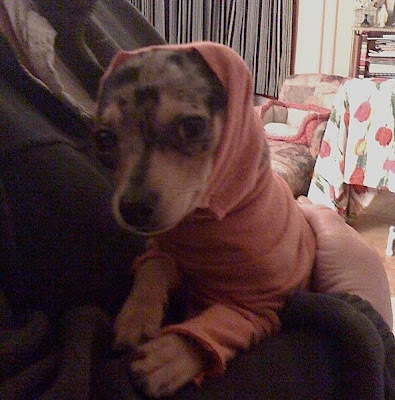 And he's not just little because he IS a puppy, he's tiny because he's half rat terrier and half chichuahua...and you know what that means: permanently tiny dogs in winter in New England must have clothing! As a seamstress and an activist for all things handmade, I wasn't simply going to go out and BUY dog gear. I also figured this would be a perfect time to recycle some materials, and I had a ton of clothes that for various reasons were no longer wearable. The moth eaten cashmere sweater. Some cool ski socks that had holes. Long-sleeved tees that were simply too sloppy for me to be wearing anymore. So I busted out some scissors and my serger, and started freestyling some puppy wear, or as we like to call it "Chi-wear!". He now has a pirate shirt, an orange ensemble with head covering, a ski sweater, and a cashmere sweater. It's warm enough now, finally, for him to just go outside to pee and be puppy-naked while doing it. That just means many months between now and next winter for making more awesome puppy clothes from recycled materials. Tip: tiny dog torsos often fit nicely into sleeves! Cut a tube of sleeve off, cut holes for legs, sew a turtleneck on and some sleeves...instant pup fashion! I'd love to see a pup fashion how-to! My pups a little bigger (15 lbs) and I can't stand the store bought stuff.